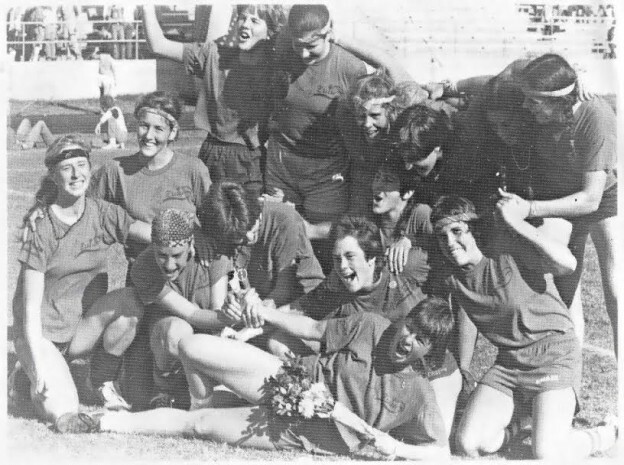 “In 1980-81, a small group of women liked to play ultimate and practiced with the men’s team on the southwest fields. 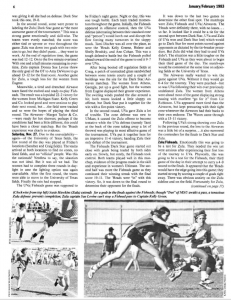 After a while the men decided to take themselves too seriously and weren’t as eager to have the women interfere with their chances to win the tournaments. So we women started our own team-Zoo Ultimate Ladies Union -ZULU. We put posters up around campus “if you are a female athlete but aren’t interested in formal collegiate teams, come and learn to play ultimate frisbee, etc.” Over 40 women showed up and we ended up with a core group of dedicated team mates that went on to win tournament after tournament. 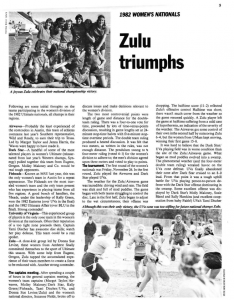 We qualified for the nationals in 1982, went to Austin, Texas and won… The men’s team didn’t make it past the eastern’s that year.” -Leslie F.